When the U.S. Department of Energy’s National Renewable Energy Laboratory in Golden released its 506-page RFP for a non-negotiable LEED-Platinum-certified office building, it wasn’t clear how something jammed full of sustainable elements would take shape. The RFP laid out not what the building should look like but how it should perform; it was up to the design-build team to come up with the rest. 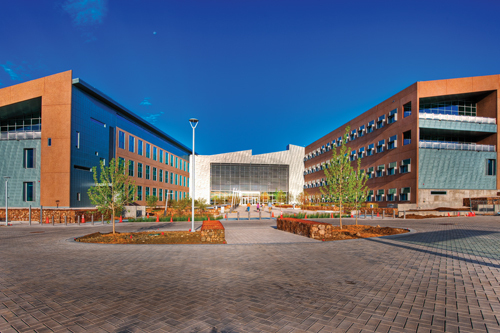 At 222,000 sq ft, the Research Support Facility, completed in June, is the largest net-zero-energy building in the nation, and is supported by a matrix of innovative features, most of which were designed by NREL scientists. To select the design and construction team for the project, NREL developed a performance-based, design-build procurement process, which required prospective teams to develop a concept design and substantiate how they would achieve the 23 requirements set forth for the project and stay within the $64-million budget, says Greg Collette, DOE project officer. “Requirements for the building included LEED-Platinum certification leading to net-zero operation, demonstrate active alternative-energy technologies, and serve as a model for construction, operation, and financing communities,” he adds. But before there could be a design, or even a concept, there had to be a team. The project required an integrated design-build team of big brains and small egos that would work together to achieve a remarkable goal. After reviewing qualifications, NREL invited three teams to compete by providing in 10 weeks a design addressing the agency’s performance-based RFP. Haselden Construction of Centennial, Colorado, and RNL of Denver, which had joined forces as one of the three teams, quickly deduced that the only way to meet the client’s green requirements was to derive the building’s form and layout from them, and secondly, that the mechanical/electrical engineer would have to lead the way. 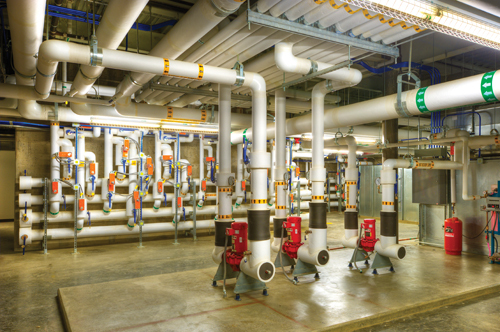 They determined to bring a leading mechanical contractor to the project and, though neither had worked with Stantec Inc.’s San Francisco office before, they asked the firm to join based on its solid reputation for innovation. Stantec Principal John Andary and his team immediately started energy modeling, passive design simulations, and other related studies. It was not until a few weeks later, after the heating and cooling and lighting systems had already been selected, that the design team met in person for the first time. The entire team, including structural engineer KL&A out of Golden and civil engineer Martin/Martin Inc. of Lakewood, convened for an extended, 3-day charrette, where members confirmed their belief that the mechanical and electrical systems would be the linchpin of the design. More specifically, the team agreed that to achieve a net-zero energy building on this scale, building orientation, sun control, daylighting, and natural ventilation were all imperative. To realize it within the client’s inflexible budget, the design had to be simple, constructible, and repeatable. Part of the trepidation centered on the fact that the project was done completely at risk. The RSF is the first application of a new project-delivery model called progressive, performance-based design-build created by the DOE to address both sustainable and fast-track requirements. “Because of the scale and the client, and the uniqueness of the project, working within the boundaries of a [set] fee was a little challenging,” Andary says. A savvy and engaged client was another key to the team’s success. Even though the RSF building is complete, the project itself isn’t over. One of NREL’s requirements was creation of a manual that could be used to guide future projects. Andary maintains that the most compelling lesson of the RSF was also the first: that engineering and performance goals can result in a project that is successful both aesthetically and programmatically. “Engineering-driven and energy-driven design, this is where the industry is going,” he says.